Image of Congressman Ted Lieu as reported in City Watch LA, 4/19/18. 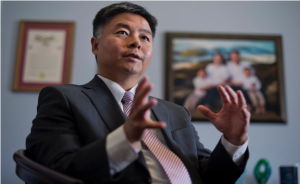 Congressman Ted Lieu offers perspective on the Mueller investigation and multiple scandals that seem to engulf this current presidency in this interview with Courts Monitor publisher Sara Corcoran. In his short 3 years in office, Lieu stands to supersede the legacy of Henry Waxman in CA-33’s congressional seat. Read the full interview with Ted Lieu, originally published in City Watch LA earlier this month: http://www.citywatchla.com/index.php/los-angeles/15301-us-congressman-ted-lieu-powerful-voice-for-the-southland.